Charting his own course through high school and beyond. To an incoming freshman, the halls of Evanston Township High School (ETHS) can seem like a crowded maze. For students with disabilities, the challenge of navigating the endless hallways can be even more daunting. When Neiro Dominguez arrived at ETHS, he was reserved and uncertain, according to Center for Independent Futures staff member Sharon Purdy. “He was a quiet, thoughtful young man in our first class of students and, like most freshmen, was unsure of his goals and plans for the future,” Sharon recalls. Though he lacked a plan, Neiro knew he wanted to manage his education as independently as possible. With our support, Neiro forged his own path toward his goals in educational and personal endeavors. Since 2006, Center for Independent Futures has worked with ETHS students, teachers, and administrative staff to bring our My Full Life™ web-based software into classrooms and the Transition House, which serves students aged 18–22. The program includes best-practice transition tools for assessment, person-centered planning, and goal setting. 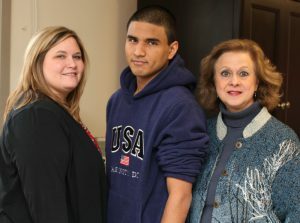 It’s a perfect fit for students like Neiro, who began working with Sharon in his first year at ETHS. “This was the first time I really thought ahead; really thought about what I wanted in the future,” Neiro says. His work with Center for Independent Futures solidified his personal learning style and strengthened his network of connections. With his new vision, he moved from a partially self-contained special education program as a freshman to almost all mainstream classes as a senior, receiving the highest citizenship and academic excellence awards from his department. “After a while, I was more comfortable talking about my plans, and I learned that I can figure out how to reach any goal the same way we did in class,” Neiro adds. As Transition Coordinator at ETHS, John Ostrowski has seen how My Full Life™ has supported students during the critical stage of transition. “The task of creating transition plans can be very daunting, but Center for Independent Futures has been so supportive and easy to work with. They are helping us equip our students with hope, confidence, and the skill sets they need to make successful transitions to the adult world,” he says. Our curriculum, which features online goal tracking and independent living skills training, allowed Neiro to begin identifying resources he could use in reaching his goals and to practice advocating for himself.